This surprisingly engaging treatise is not a cookbook, is not written by an Italian, and does not promote a restaurant or a particular style of cooking. Nonetheless, Kostiukovich, an erudite food-obsessed Russian who works translating Umberto Eco’s books, manages to illuminate the many mysteries of Italian cuisine in a text that inspires one to want to learn more about and cook more Italian food. She provides historical and botanical details that deepen her text beyond the typical food book, and alternates chapters on Italian regions with ones on topical subject matters as Slow Food, Totalitarianism, and Eros. Every three or four pages, Kostiukovich comes up with a unique observation, a compelling regional specialty to try, or an amazing piece of food history. 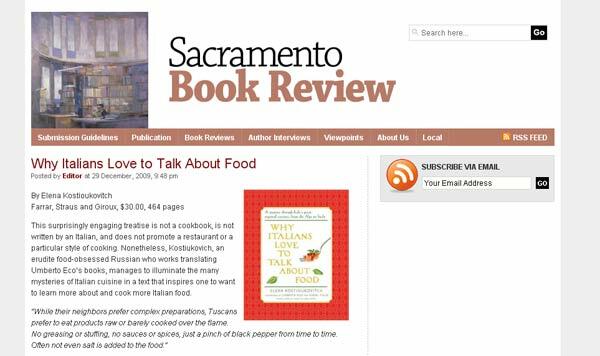 If you read her book, you may not be able to stop talking about Italian food.